In this blog I usually write about the rides I take during my lunch breaks during the workweek. But sometimes the destination of a ride necessitates going on a weekend. That was the case for this ride, because I was going to go see a rare and unique amorphophallus titanum, also known as the titan arum, but most commonly referred to as a corpse flower, which is getting ready to bloom at the United States Botanic Garden (USBG), located at 100 Maryland Avenue (MAP) in the southwest area of the Downtown neighborhood in D.C. 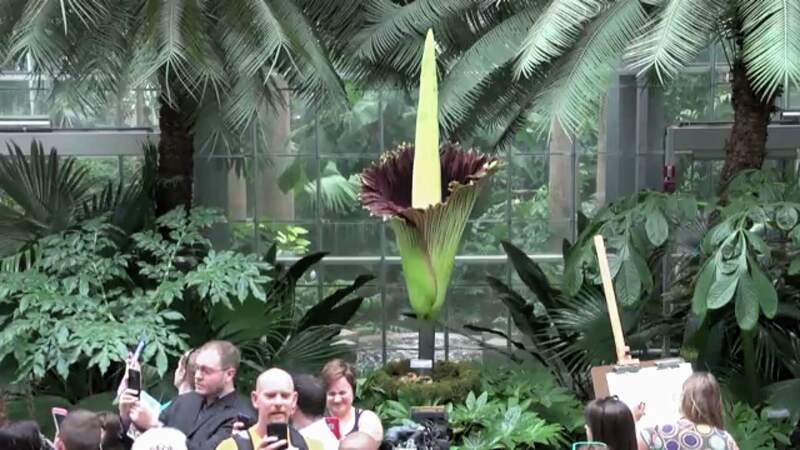 It is predicted to bloom sometime between today and Tuesday, and when it happens the bloom will last only 24 to 48 hours before it quickly collapses. So I didn’t want to wait until next week and possibly miss it. It is the first bloom of this particular plant, which is six years old. 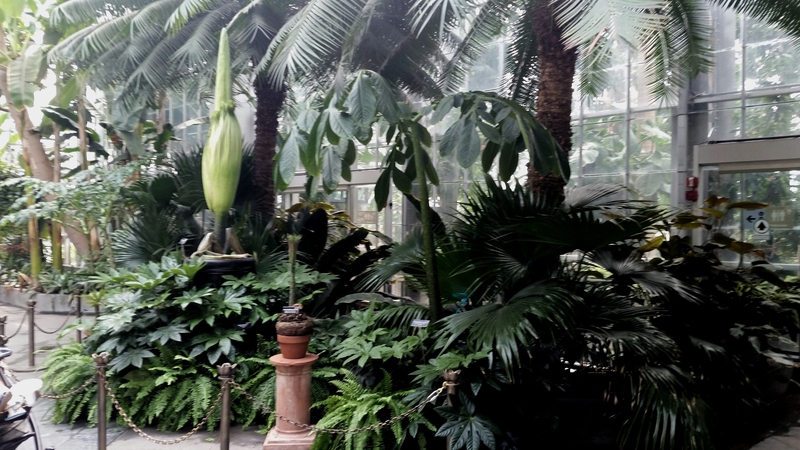 When it first went on display on July 22nd, the plant was only three and a half feet tall. But since that time it has grown as much as eight inches in just one day. In the past 12 days this magnificent specimen has grown an incredible four feet three inches, and is now over seven feet tall. 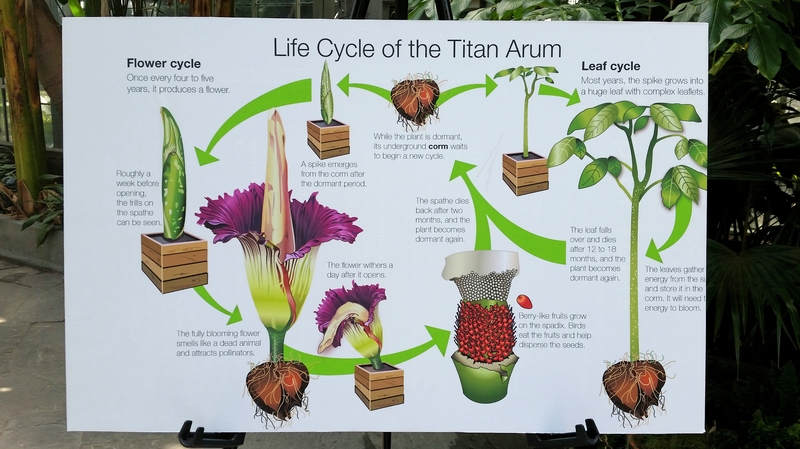 The blooming of a Titan Arum is rare because does not have an annual or even cyclical blooming process. The time period between flowerings is unpredictable, and can span from a few years to a few decades. And there have been only 192 recorded instances of cultivated bloomings since records began. And because the gigantic flower is native to only the rainforests of Sumatra, Indonesia, it is even more rare to be able to see a bloom in the United States. 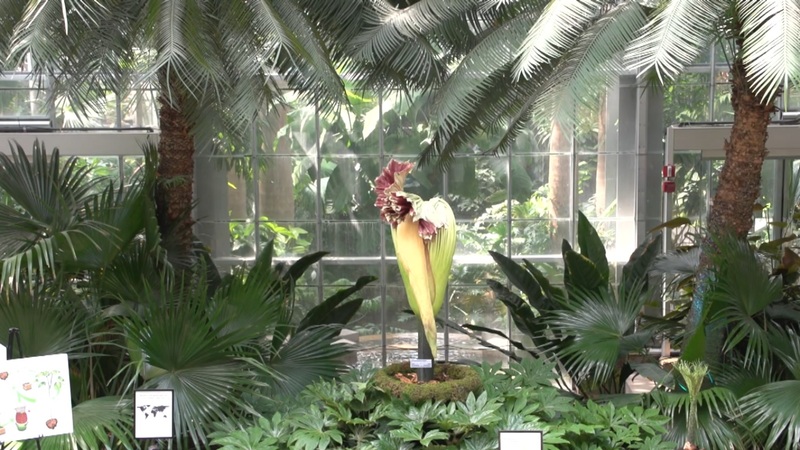 The plant is also unique because when it is at peak bloom it possesses an odor that many say smells like the rotting flesh of an animal carcass, with its putrid smell being most potent at night into the early morning. Some people travel around the world hoping to see one at the moment it flowers. For botanists and the public, being “in the right place at the right time” to see one of these magnificent plants in bloom can be an once-in-a-lifetime treat. But for me, I was able to see one bloom here at the Botanic Garden in 2013, so this will be the second time I’ve been fortunate enough to see one bloom. So if you’re able to, I highly recommend a trip to the Botanic Garden to see this natural wonder. However, if you’re unable to make it here, you can still check it out online at the livestream provided by the USBG. 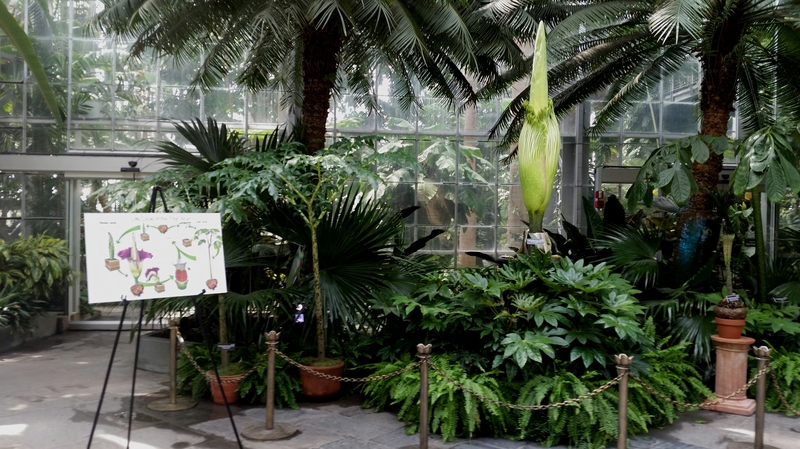 UDATE (08/02/2016): The Corpse Flower bloom began to open this morning, and should be in its full, odiferous bloom by the end of the day. The Botanic Garden will be extending their hours today until 11:00pm. 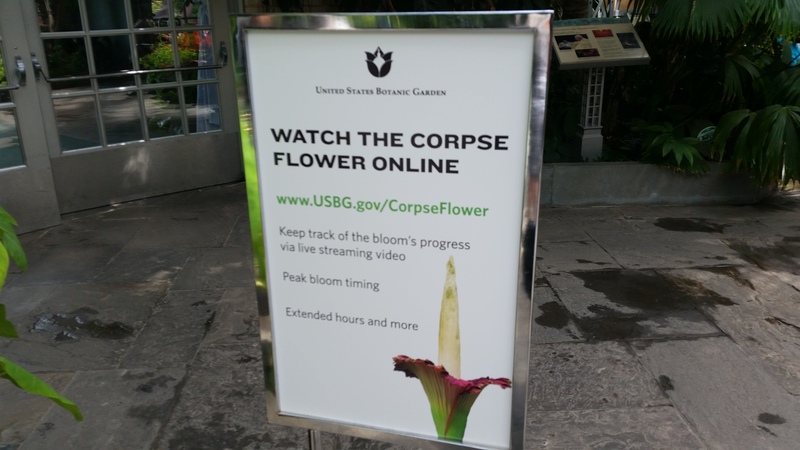 UPDATE (08/05/2016): The Corpse Flower has collapsed. From the outside, the 19th-century sandstone building at 750 Park Road (MAP), just off Georgia Avenue in northwest D.C.’s Park View neighborhood, appears to stand out for its architectural excellence and aesthetic beauty. Designed by the architectural firm of A.B. Mullett & Company and completed in 1905, there don’t appear to be any other buildings of similar style and quality in that area of the city. But as interesting as I found the appearance of the building to be when I happened upon it on this lunchtime bike ride, it’s what happened in the building that gives it even more character. 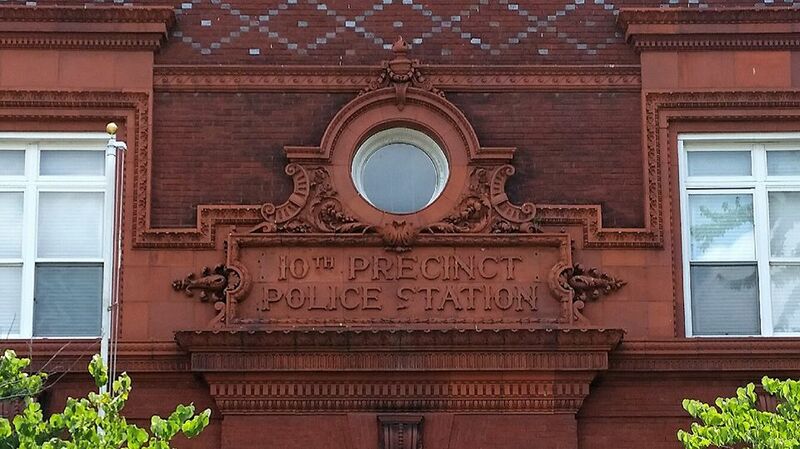 The building was originally built as the 10th Precinct Station House for the Metropolitan Police Department (MPD). And at the time touted by Police Chief Major Richard H. Sylvester as having some of the most modern and secure jail cells in the city. In fact, Chief Sylvester had so much confidence in his newest jail cells that he invited escape artist Harry Houdini, who happened to be in town performing at Chase’s “Polite Vaudeville” theater for his first ever show in the nation’s capitol, and had been bragging about his escape skills, to come visit the 10th Precinct Station House and try one out. With a reputation to uphold and welcoming the publicity, Houdini readily accepted the challenge. And on New Year’s Day of 1906, he turned himself in to be incarcerated, albeit for an indeterminate amount of time, at the 10th Precinct. Despite attempts to stymie his escape by changing the locks after Houdini had already examined the cell, locking him behind five separate locks, stripping him of his clothing and locking them up in an adjacent cell, and handcuffing him with handcuffs from the Secret Service rather than police handcuffs, Houdini walked out a free man less than twenty minutes later, fully clothed and smirking. Although Chief Sylvester was surprised and disappointed to see Houdini escape, he could take some consolation in the fact that it was the 62nd jail cell from which Houdini had escaped. 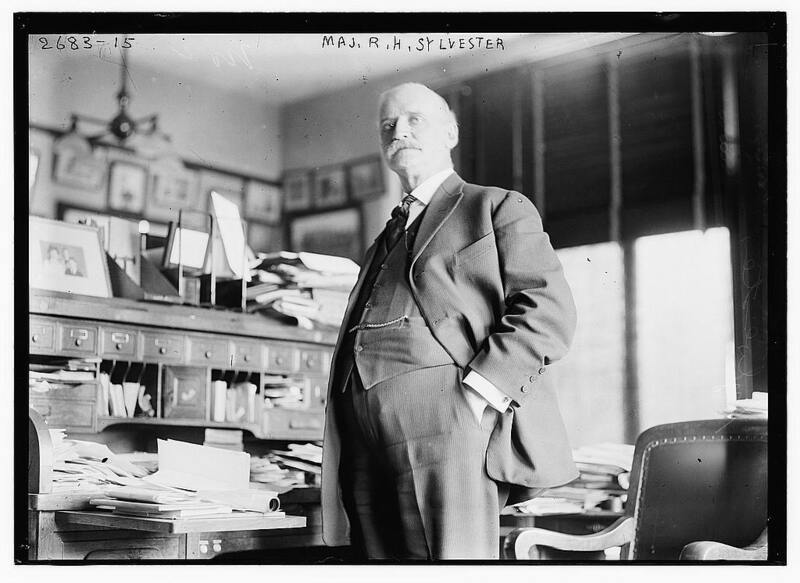 But Chief Sylvester would become more concerned when Houdini went on later that same week to escape from an even-more secure cell in the Fifth Precinct jailhouse, as well as “the Guiteau cell” on Murderers’ Row at the United States Jail, which had formerly housed Charles J. Guiteau, the man who assassinated President James Garfield. However, Chief Sylvester would learn from Houdini’s escapes, and make his jail cells even more secure in the future. Houdini was not invited back to test the improved cells though. 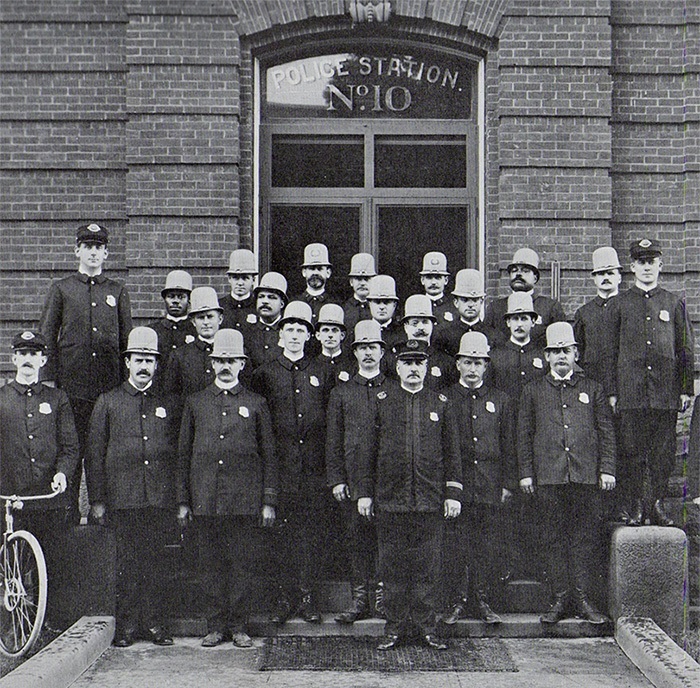 Still standing today, the 10th Precinct Station House is listed on the District of Columbia Inventory of Historic Sites and the National Register of Historic Places. 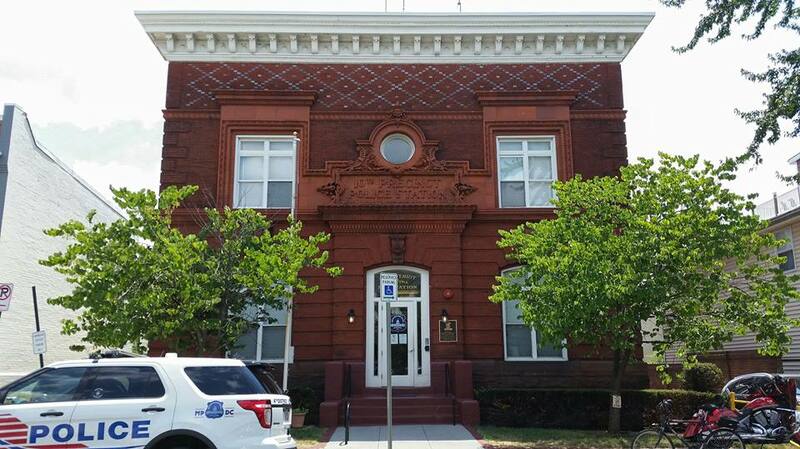 However, after a number of redistrictings and reorganizations over the years, it is now home to the MPD’s Fourth District Substation, serving the city’s Park View, Petworth, Mount Pleasant and Columbia Heights neighborhoods. Note: After the three successful jail breaks in D.C.’s jails in January of 1906 helped solidify his reputation as the “Handcuff King and Prison Breaker”, Houdini frequently scheduled shows in D.C. during his tours. Over time, and as his fame increased, he drew larger and larger crowds when he performed here. Ten years after his escape from the cell in the 10th Precinct Station House, he performed an escape while hanging upside down in a straitjacket outside B.F. Keith’s Theater, which attracted a crowd of over 15,000 spectators. At that time, it was the largest crowd in the national capitol city’s history aside from a Presidential inauguration. And another ten years after that, Houdini came back again to testify before Congress on the subject of spiritualism and D.C.’s fortune-telling laws. 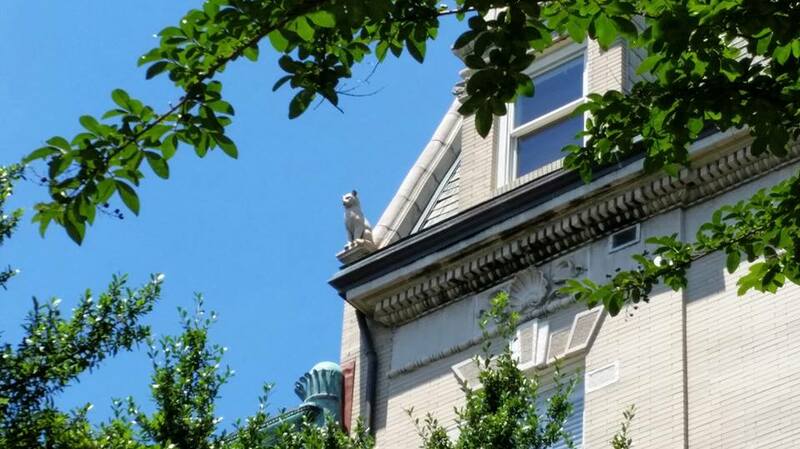 While riding down Embassy Row in northwest D.C.’s Sheridan-Kalorama neighborhood during this bike ride, I saw what appeared to be a cat precariously perched on the roof of the house located at 2201 Massachusetts Avenue (MAP). Not knowing if it was stuck or just sitting there taking in the view, I decided to take a closer look. But upon closer inspection it turned out that it wasn’t actually a cat at all. 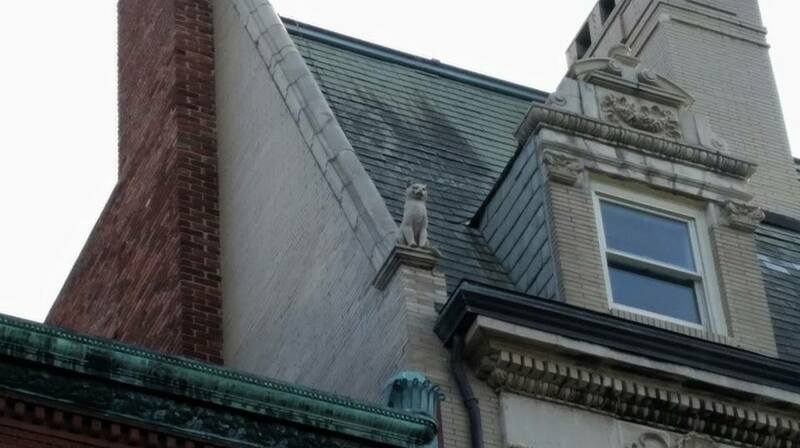 It was a lone, gargoyle-like statue of a cat. Finding this to be unique to the neighborhood as well as interesting, I decided to try to learn more about the cat and the house upon which it sits. Commonly known as the Argyle House, but also referred to as the Abercrombie-Miller house or Miller House, it is a Beaux-Arts mansion designed by the associate architect of the Library of Congress, Paul J. Pelz. 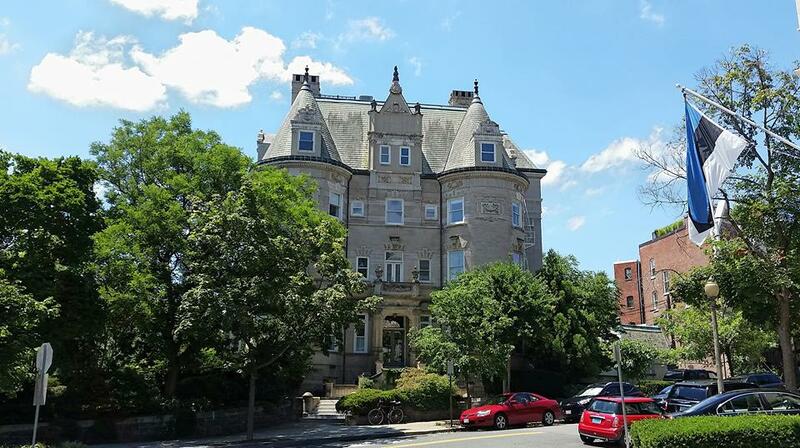 Constructed around 1901, it was originally built for a wealthy, retired Navy Commander named Frederick Augustus Abercrombie-Miller. A few years after Miller passed away in 1908, the house was sold by his widow, and subsequently changed hands several times after that. 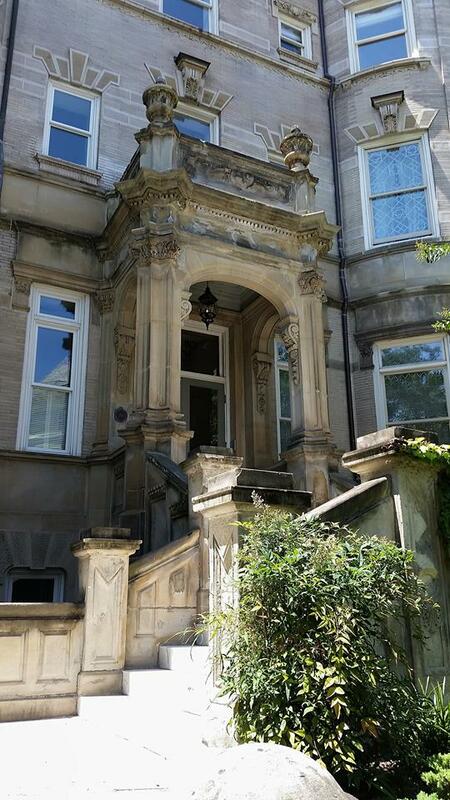 During most of the 1920s it was owned by D.C. developer Harry Wardman or his business partners, who between 1923 and 1926 leased it to the Costa Rican and Salvadorean Legations. 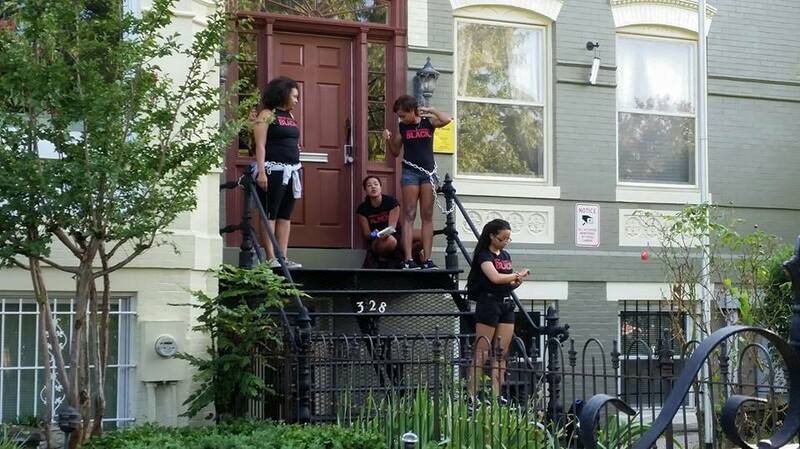 But like many mansions in D.C. at that time, it was divided into apartments during the Great Depression and rented as a boarding house. Today the Argyle House has been converted into a nine condominium units. An integral part of the original house is the 500-square-foot, semi-detached garage, which is located adjacent to the alley behind the house, which can be accessed around the corner on 22nd Street. 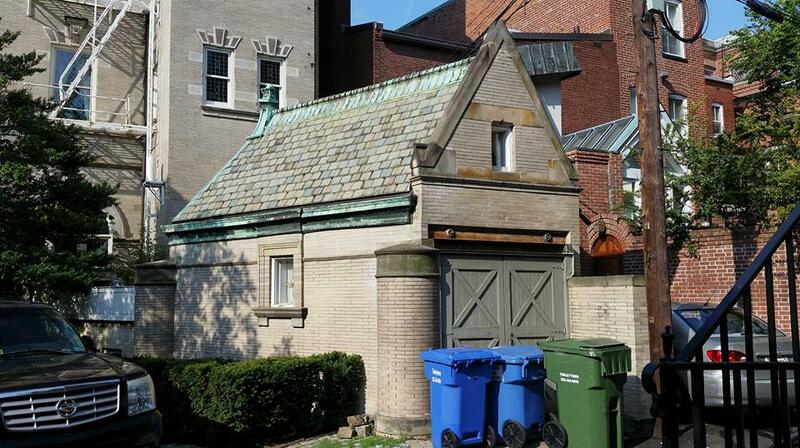 Built at the same time as the house, it’s one of the first local constructions of its kind designed specifically as a garage to store an automobile instead of a stable house for a horse carriage. From 1986 to 2009 the garage was used by Olga Hirschhorn, widow of entrepreneur Joseph Herman Hirshhorn, and founder D.C.’s Hirshhorn Museum, to store part of her art collection. Hirschhorn named the structure her “Mouse House”, in a lighthearted reference to the house’s cat statue. So what about that cat statue? It turns out that because Miller had been a Naval officer, the house includes a number of maritime architectural accents. 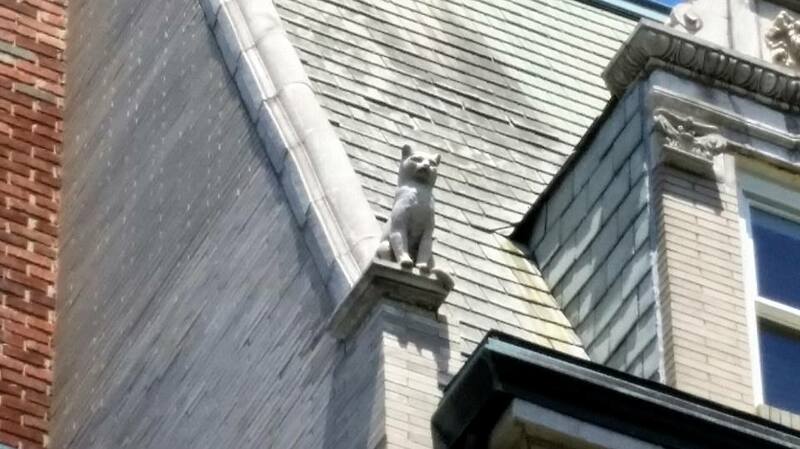 Among them is the cat on the ledge facing Massachusetts Avenue, which is intended to depict a ship’s cat. Ship cats were a common feature on many trading, exploration, and naval ships of that time. The cats not only offered companionship to sailors who could be away from home for long periods, but would catch mice and rats aboard the ship, which could otherwise cause damage to ropes, woodwork and other parts of the ship, as well as damage to the cargo and provisions the ship was carrying. The ship cats could also be integral to preventing the spread of disease, which could be carried by the rats and mice, to other parts of the world. So the Argyle House cat continues to sit there as it has for over a century, with most passersby oblivious to it. And of those who do see it, most don’t know anything about it or why it’s there. But now I do, and so do you. The summer heat was a little milder today than it has been lately, and with forecasts predicting that temperatures will be increasing to over a hundred degrees within the next few days, I decided to go for my daily bike ride a little early again today, and I made it a long one. 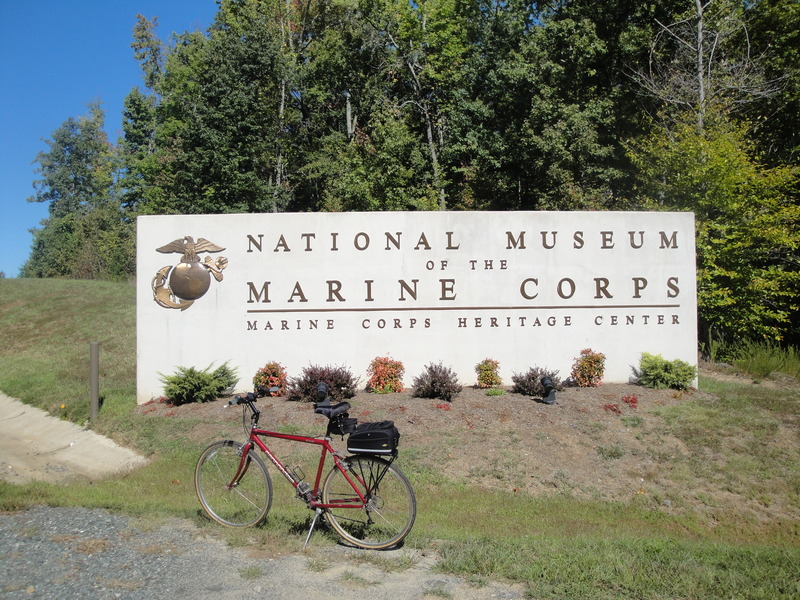 For today’s ride I decided to ride around southeast D.C.’s Anacostia neighborhood. 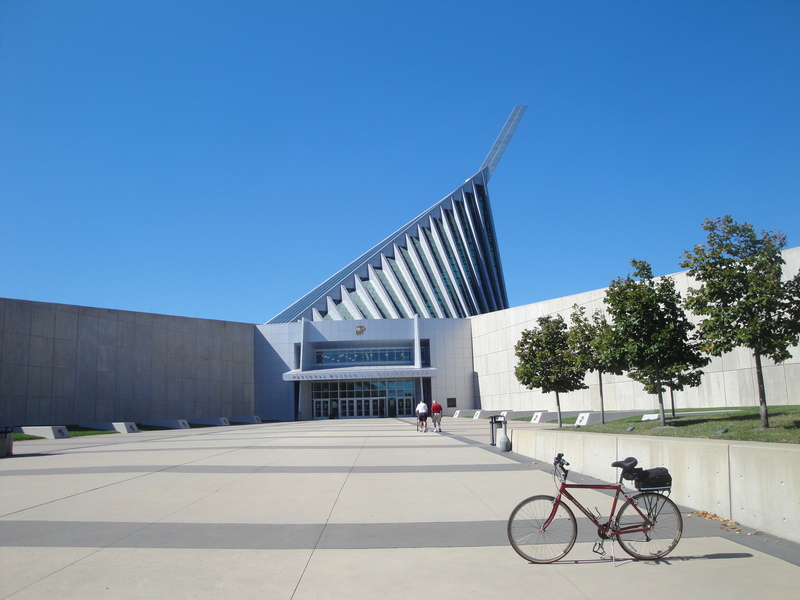 So I took my favorite route, going past Robert F. Kennedy Stadium and through Kingman and Heritage Islands, and started out today’s Anacostia ride on Anacostia Avenue near Benning Road. 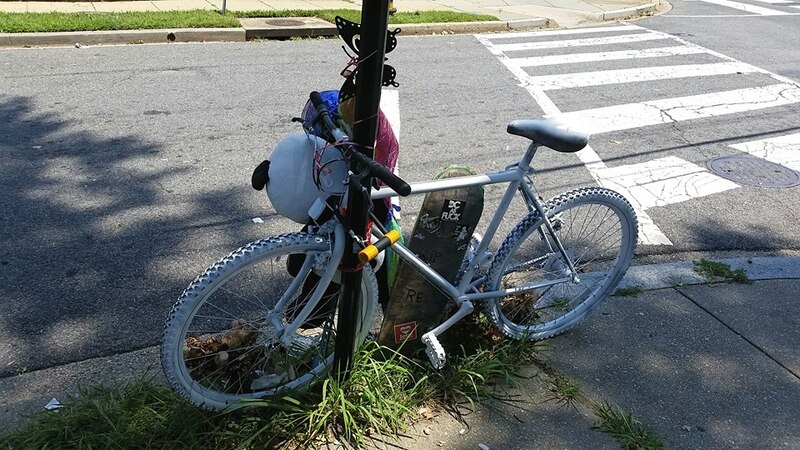 By definition, “a ghost bike is a bicycle painted white and left as a memorial, usually by other cyclists, at a site where a cyclist was fatally injured by a collision with a motor vehicle.” And as I would come to find out, the ghost bike I saw on this ride, which is located in the 2600 block of Minnesota Avenue, at the corner of Minnesota Avenue and Burns Street (MAP), marks the spot where a 23-year-old cyclist named Jerrell Robert Elliott was killed by a hit and run driver just last month. A ghost bike carries with it an extremely personal connection because it memorializes someone at the very location where that person was killed. 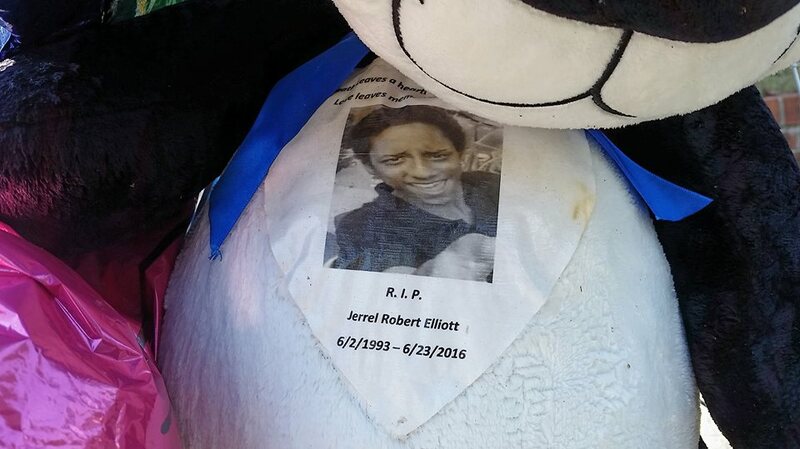 And Elliott lived only a few feet from where he was hit and left to die very early in the morning of July 23rd. He was considered by family and neighbors to be a really good kid with a bright future. As a child, he was a member of The Young Marines, the Fort Dupont Ice Arena’s youth team and the Metropolitan Police Department (MPD)/D.C. Police Teen Jr. Police Academy. And he remained active as an adult. The 23-year-old loved playing hockey and riding his bike, and is thought to have been on his way home from a local gym when he was hit. 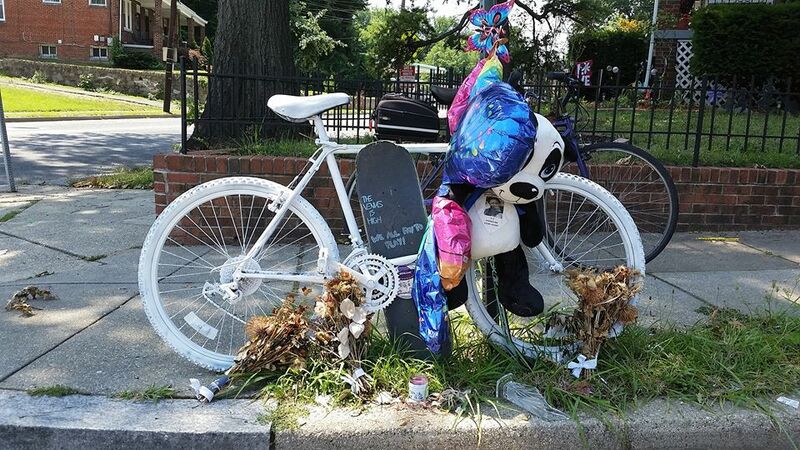 While I was there paying my respects and taking a photo of the ghost bike and memorabilia that had been left at the site, an incredibly nice young woman from the neighborhood named Wanda stopped to talk with me. She was friendly, and caring, and seemed to embody the best qualities of the neighborhood. She told me a little about Elliot. She also told me about how touched his family was by the cyclists who had brought and placed the ghost bike there. Then she told me about two women who had stopped to help him after he was hit, but that no one had since come forward with any information about what had happened. She said she had a bike, and we also talked about the neighborhood, and how the cycling infrastructure is not only inadequate overall, but how it has not kept pace with more affluent areas of the city. 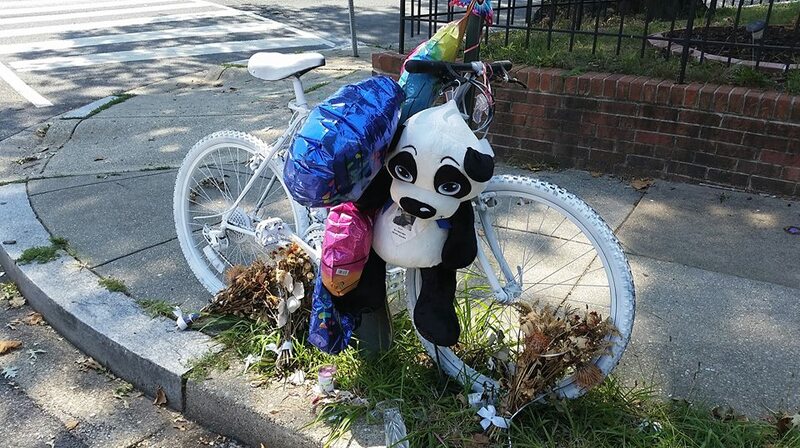 Before she left, she stopped to clean up a broken vase and some debris at the base of the ghost bike, further exemplifying to me how thoughtful and welcoming so many people in the Anacostia neighborhood are. 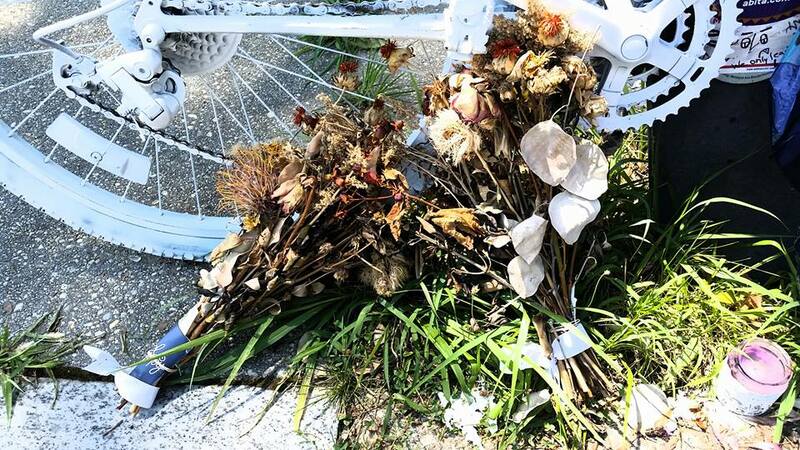 In addition to the personal aspect of a ghost bike memorial, its meaning and appearance also invoke a reminder of the vulnerability of all cyclists. According to the Insurance Institute for Highway Safety, 726 cyclists were killed in this country in bicycle/motor vehicle crashes in 2014, the most recent year for which statistics are available. So as I rode back to my office at the end of my ride, I rode with a renewed awareness of the need to always ride defensively on my bike, and to drive cautiously when I’m in a car. I hope all of you reading this will do the same. NOTE: Police are still searching for the driver of the car that hit Elliott. The suspect was driving a gray colored vehicle, possibly a Volvo, according to a release from the MPD. “We’re looking for anyone who may have seen anything—either leading up to the actual crash or even after the crash,” according to Officer Robert Wilkins. Information can be provided anonymously through The D.C. Crime Solvers Program by calling (202) 727-9099, or you can text your tip to 50411. We’re in the middle of a heat wave here in D.C. And it has been so hot in the afternoons lately that for today’s bike ride I decided to go earlier in the day when the heat was a little less oppressive. In fact, I went for my daily ride shortly after arriving at work this morning. And since I usually begin my workday relatively early, rush hour was still ongoing while I left to go out on this ride. This is important because the timing played a part in what I saw during today’s ride. During my ride, I decided to ride Julius, my orange recumbent bike, around the tree-lined, shaded streets of northeast D.C.’s Capitol Hill neighborhood. 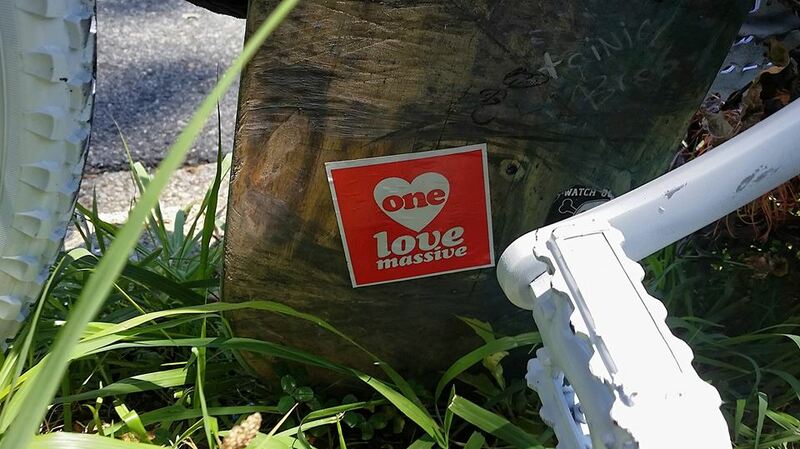 As I was riding down Massachusetts Avenue approaching the local Fraternal Order of Police lodge, located at 328 Massachusetts Avenue (MAP), I saw a crowd gathered near the building and at the end of the block near Stanton Park. So I rode closer to investigate. 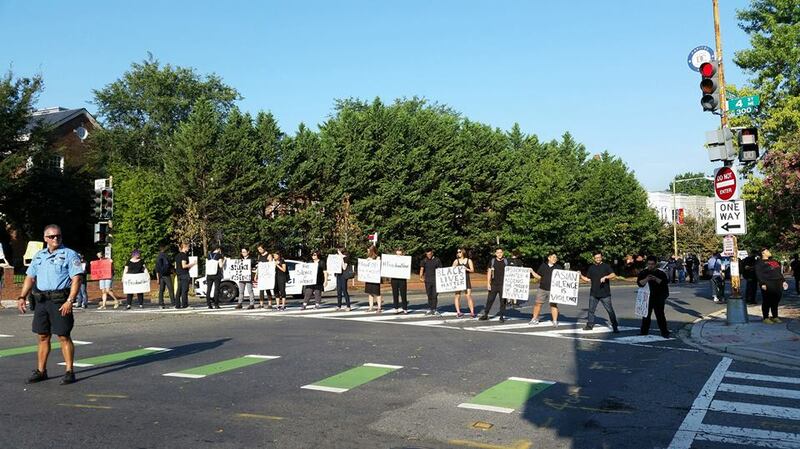 And it turns out that it was a protest by the group which calls itself Black Lives Matter, along with others affiliated with Black Youth Project 100. The Fraternal Order of Police District of Columbia Lodge #1 is one of the largest lodges in the United States. Its membership consists of approximately 10,000 members from over 114 various District and Federal agencies. The lodge also houses the organization’s national legislative office, which in the wake of the recent killings of police officers in Dallas and Baton Rouge, is calling for Federal legislation classifying the intentional targeting of police officers as a hate crime. And the organization’s position seems to have gained additional momentum when President Obama stated that the black sniper who killed the white officers in Dallas should have been prosecuted for a hate crime if he were still alive. 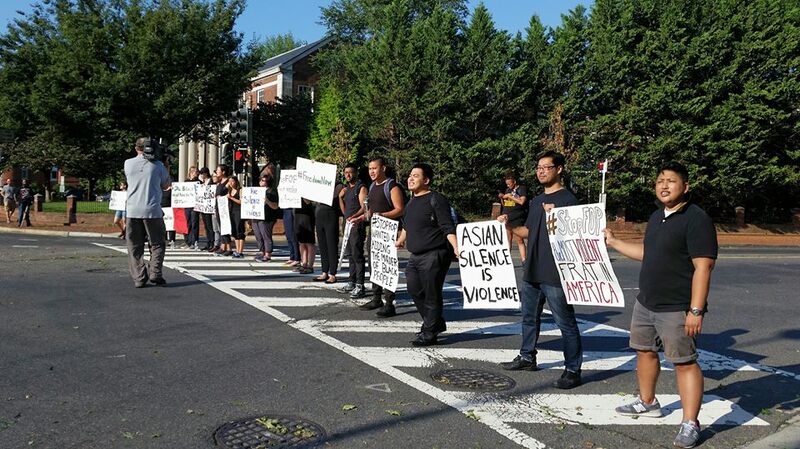 Today’s Black Lives Matter protestors were gathered in the street in front of the lodge, joining arms to block rush hour traffic at the intersection of 4th Street and Massachusetts Avenue. 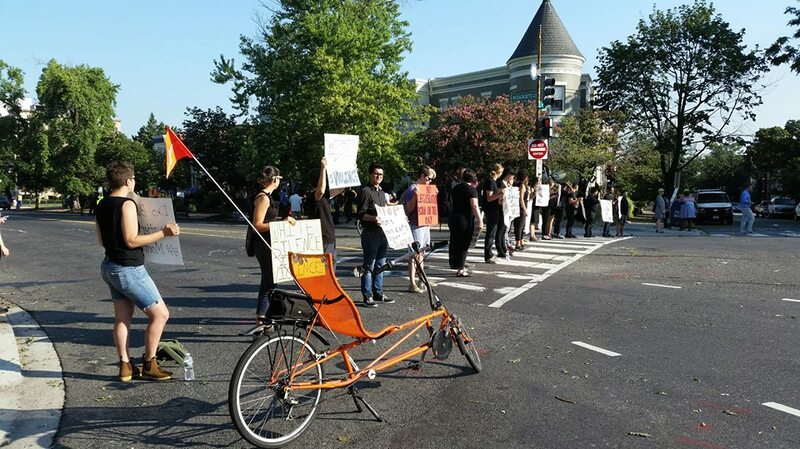 I heard some of the protesters shout to the commuters who were simply trying to get to work, “If this is your normal way to work, please go around. The FOP protects killer cops.” Others said to at least one pedestrian on the sidewalk, “Use your white privilege to walk around.” (See video below.) Some protestors were also blocking the gateways and access to the building, while others had chained themselves to stair railings and fixtures at the entrance to the lodge. 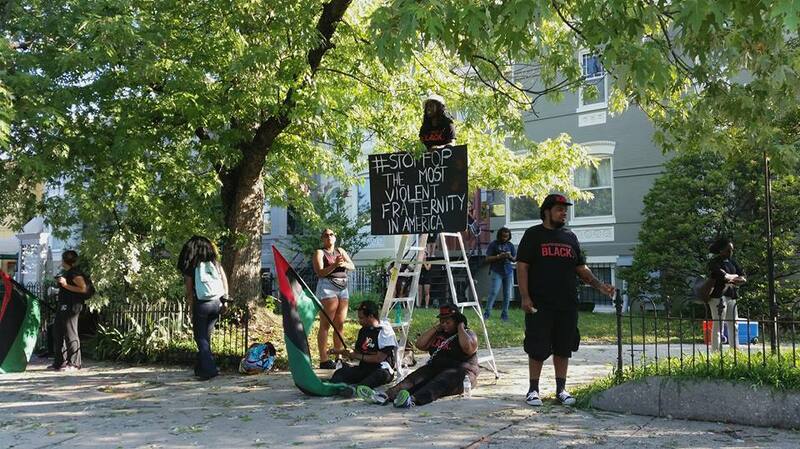 At one point they even hoisted a Black Lives Matter flag atop a flagpole in front of the building. In response, Jim Pasco, executive director of the Fraternal Order of Police’s D.C. office, said he supports the protesters right to assemble. But because of the disruptive influence of the protestors attempting to block access to both the street and the building, he had decided to close the lodge for the day said they would continue their work from other locations. So as Mr. Pasco and the other employees departed, they left behind a number of on-duty Metropolitan Police Department Officers. 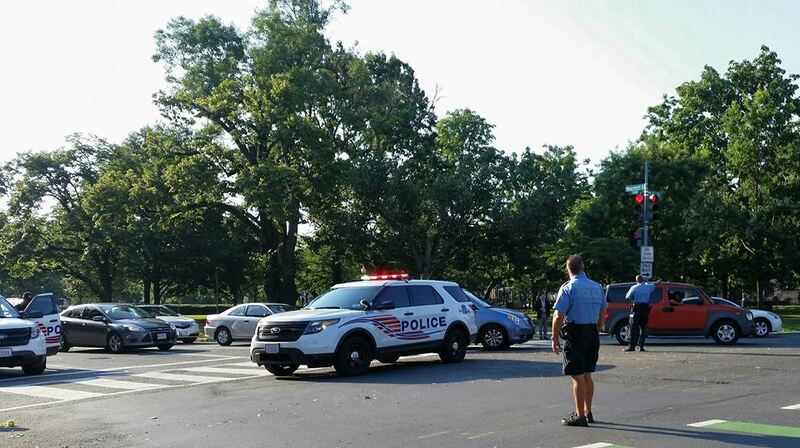 Those officers, who were most likely also members of the lodge itself, blocked and rerouted the vehicular traffic to protect the protestors themselves, and remained on the scene to protect their right to free speech. 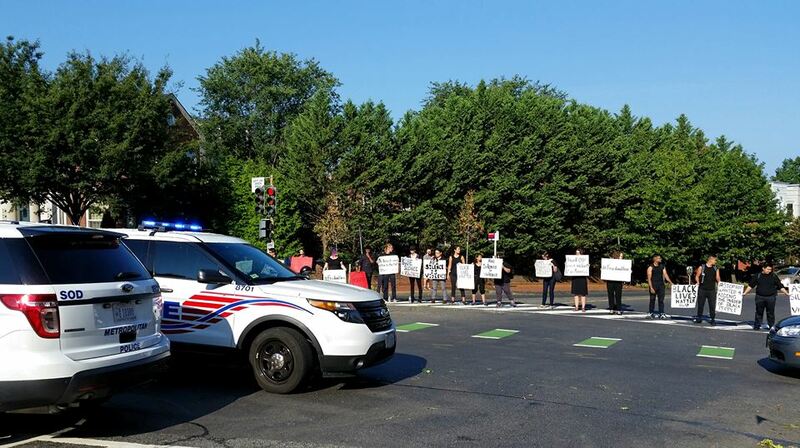 All of the police officers there remained calm throughout, and continued to act in a professional way to the protestors who were there to protest against them. A short time back during one of my lunchtime bike rides I found myself in Franklin Square Park (MAP) enjoying some take-out from a favorite downtown eatery located across the street from the park, Soho Café & Market. It was a particularly warm day and, as I was enjoying some cold pasta salad, I watched a group of people who were gathered near the fountain situated in the main plaza in the middle of the park. After watching them for a while I figured out what the gathering was. So I chose to join them. The group of people turned out to be a congregation. And the gathering was a “Street Church” service, which is an outreach and social justice ministry of the Church of the Epiphany. I had previously visited and wrote about the church in this blog. And I even knew about the Street Church ministry. But attending the service that day was the first time I got to experience it for myself. 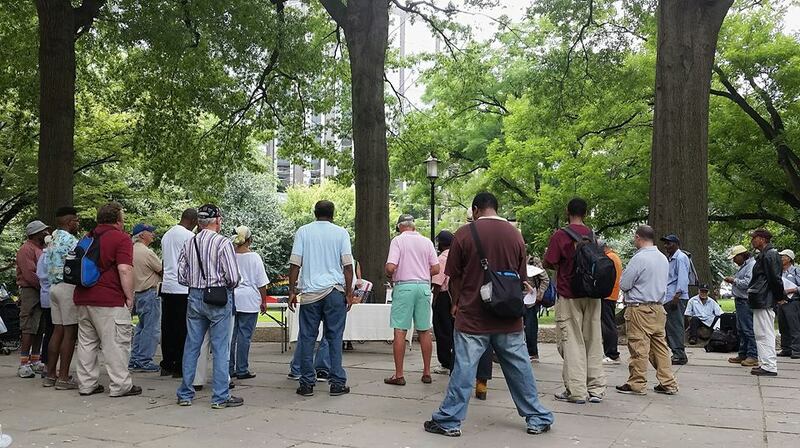 Street Church takes place in the park every Tuesday, from 1:00pm to 1:30pm. 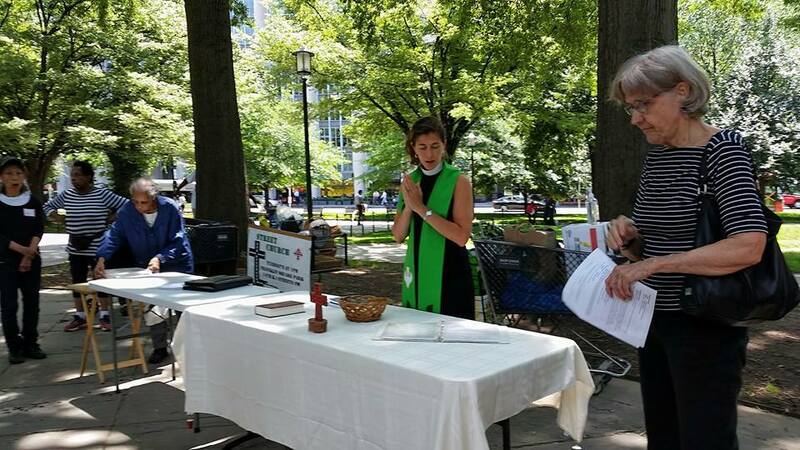 The service, which is part of the Ecclesia Ministries network which began with Common Cathedral in Boston, includes singing, prayer, participative preaching, and the administration of the Eucharist. The congregation usually includes approximately 30 to 50 downtown poor, as well as church volunteers and other various visitors and passersby, like me. The mission of Street Church is to build a diverse and inclusive community, worship as one, and give and receive the love of Christ. Not only did I enjoy my first experience at Street Church, it also came at a very meaningful time for me. At the end of the service, the priest invited people to come forward to an area near one of the park’s gigantic trees if they wished to receive a healing prayer. And it just so happened to be the area was where I already was standing. Then, as she very politely began to ask me to make room for those who were going to be coming forward, I told her that I was there to pray with her. I told her how I had been diagnosed with cancer last fall, and how I had been to my oncologist a few days prior for a follow up, and that I was a little anxious about the results I was scheduled to receive the next day. So we prayed together before I left. And I am now happy to be able to report that I remain cancer free. I have gone back to Street Church a few times since that first encounter. And I plan to continue to attend when I am able to. Someday soon I would also like to join in with their regular volunteers in the Epiphany kitchen and help prepare the lunches brought to and served in the park. In addition to a core of volunteers who come on a regular basis, they welcome any volunteer who would like to participate in this ministry. 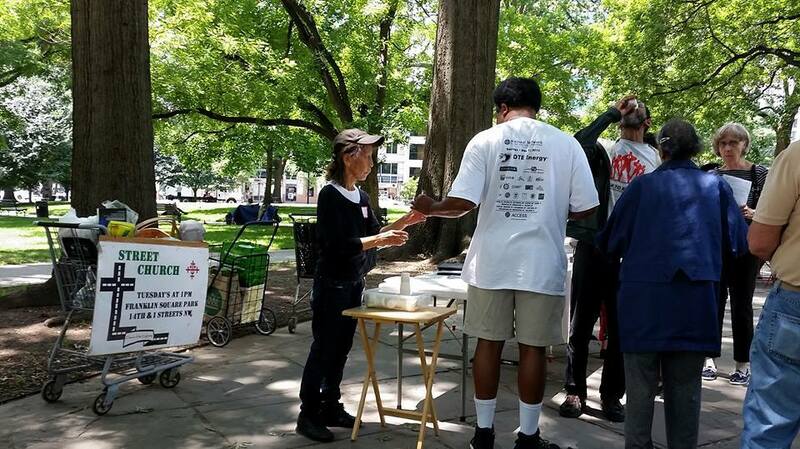 They also offer the opportunity to volunteer in the park, spending time and being in relationship with the downtown poor through worship, lunch, and conversation. Another meaningful volunteer experience at Street Church is becoming a Street Church Partner. By becoming a Street Church Partner, youth and adult groups are able to participate in social justice ministries with the downtown poor and to allow this experience to deepen their faith journeys. 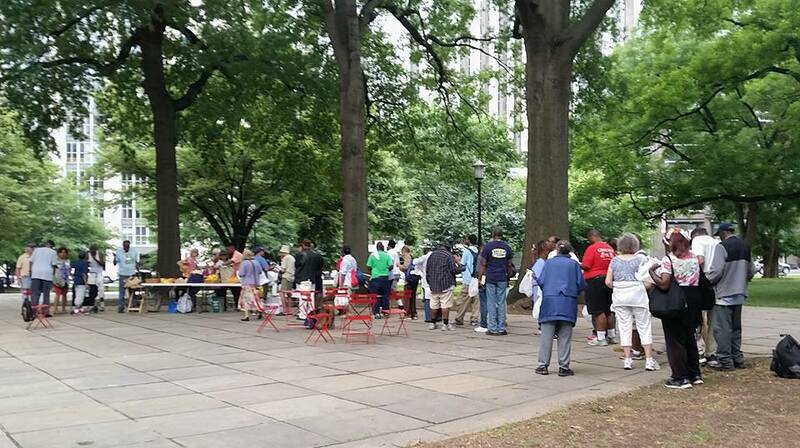 Street Church Partners participate in the full schedule of preparing lunch, participating and serving in the park, plus orientation beforehand and spiritual reflection afterward. Street Church Partners also contribute to the cost of the Street Church lunch on their day. Since all are welcome, I feel confident speaking on behalf of Street Church in inviting everyone to participate, whether it’s through attending, volunteering, or contributing financially to the cost of providing the food that accompanies the spiritual nourishment that Street Church provides. 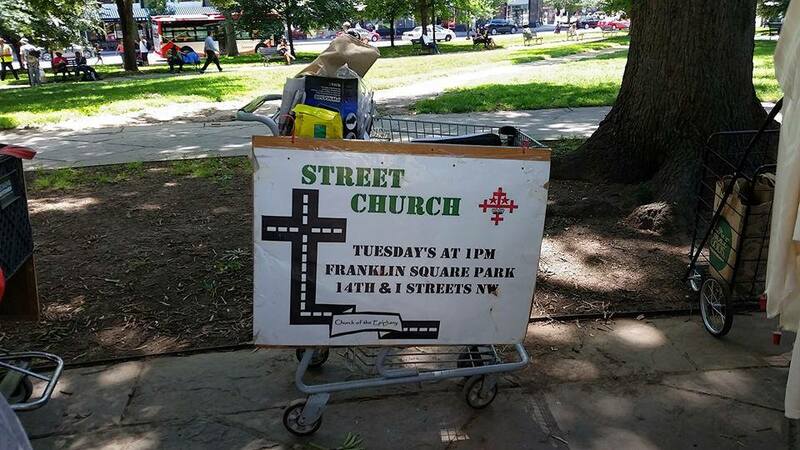 Or if you don’t live in the D.C. area or are otherwise unable to be part of Street Church, I would encourage you to seek out something similar wherever you are. NOTE: The service in the park and the downtown poor who attend remind me of a story about a church. However, the church in the story is nothing like Street Church. The story goes something like this. One Sunday morning an old man entered a church just before services were to begin. Although the old man and his clothes were spotlessly clean, he wore an old and faded pair of slacks, a plain shirt without a collar, and a pair of shoes that were appeared worn and ragged and had paper-thin soles. And in his hand he carried a worn out old hat, and a equally worn out Bible. The church he entered was in a very upscale and exclusive part of the city. It was one of the oldest, largest and most beautiful churches the old man had ever seen. And the people of the congregation were all dressed in expensive clothes and accessories. As he took a seat, the others moved away from him. No one greeted, spoke to or welcomed him. They were all appalled at his appearance and did not attempt to hide it. After the service as he was leaving the church, the priest approached him and asked the man to do him a favor: “Before you come back in here again, have a talk with God and ask him what he thinks would be appropriate attire for worship.” The old man assured the preacher he would. “I did,” replied the old man. “If you spoke to God, what did he tell you proper attire should be for worshiping in here?” asked the priest. 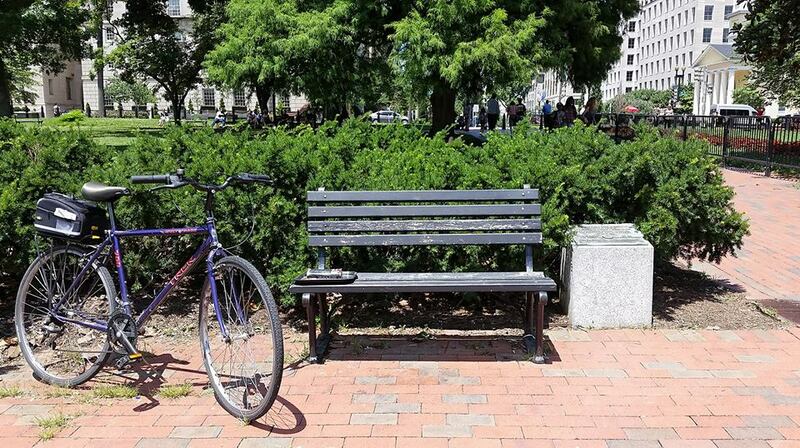 On today’s bike ride I stopped in Lafayette Square Park (MAP) to eat my lunch. And as I was sitting on a bench near the Andrew Jackson statue in the middle of the park, I noticed a bronze plaque on a granite base next to the bench. 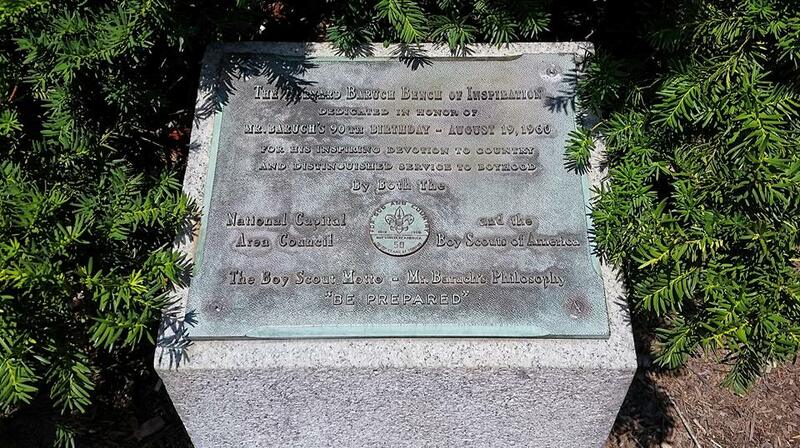 The plaque reads: “The Bernard Baruch Bench of Inspiration; Dedicated in Honor of Mr. Baruch’s 90th Birthday – August 19, 1960 For His Inspiring Devotion to Country And Distinguished Service to Boyhood; By Both The National Capital Area Council and The Boy Scouts Of America; The Boy Scout Motto — Mr. Baruch’s Philosophy; ‘Be Prepared’.” So naturally, I had to look into who Bernard Baruch was, and why he had a bench in the park dedicated to him. Bernard Mannes Baruch was born in August of 1870, in Camden, South Carolina. He grew up in New York City, where his family moved when he was eleven years old, and graduated from the City College of New York. After graduating in 1889, Baruch initially worked as an office boy in a linen business before later starting work as a broker and then a partner at A.A. Housman & Company. With his earnings and commissions, he bought a seat on the New York Stock Exchange, where he amassed a fortune while he was still in his twenties. After his success in business, Baruch left Wall Street in 1916 to become an adviser President Woodrow Wilson during World War I. Three years later President Wilson asked him to serve as a staff member at the Paris Peace Conference, where Baruch supported Wilson’s view pertaining to the creation of the League of Nations. In the 1920s and 30s, Baruch remained a prominent government adviser, and supported Franklin D. Roosevelt’s domestic and foreign policy initiatives after his election, which included being part of the President’s “Brain Trust” during the New Deal. During this time he also expressed his concern that the United States needed to be prepared for the possibility of another world war. 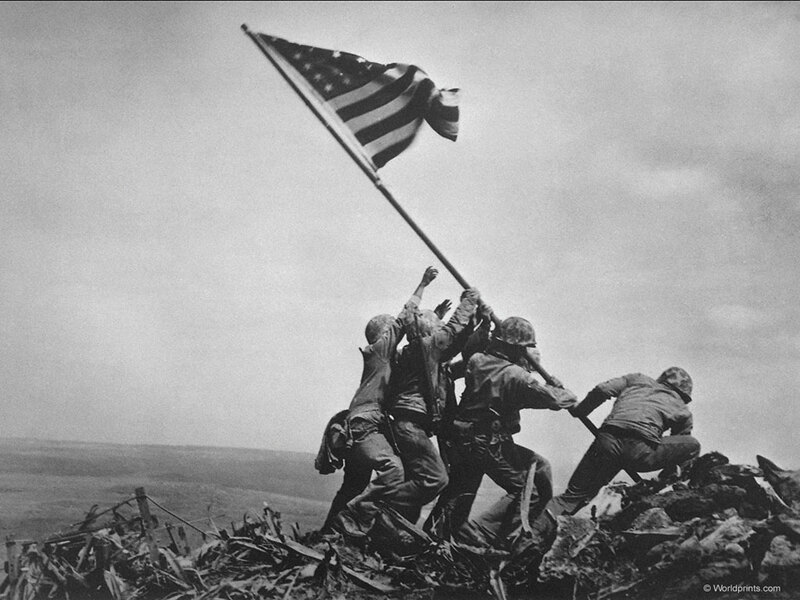 Then when the United States entered World War II, President Roosevelt appointed Baruch a special adviser. 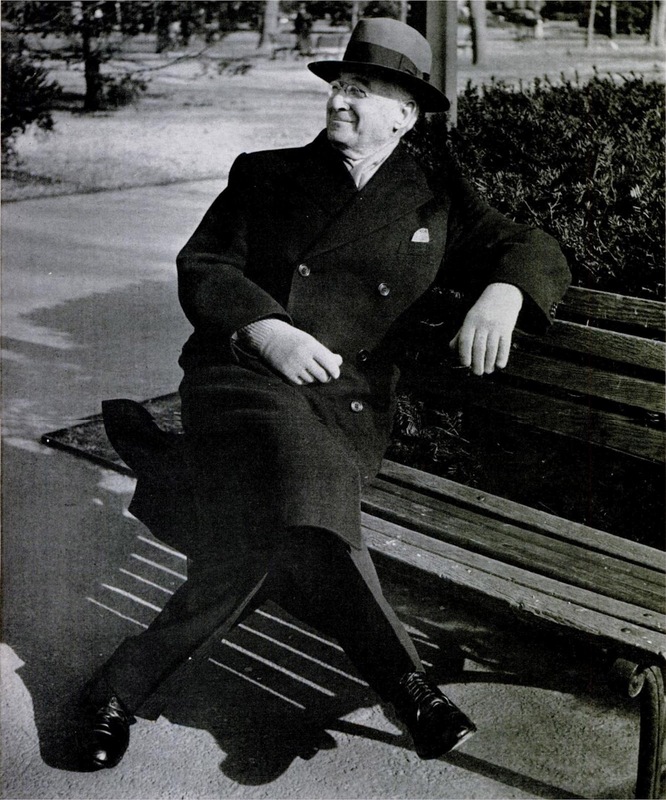 And after World War II, President Harry S. Truman appointed Baruch as the United States representative to the United Nations Atomic Energy Commission, where he played an instrumental role in formulating policy regarding the international control of atomic energy. The designation of “elder statesman” was applied to him perhaps more often than to any other American of his time, and he continued to be active until his death in June of 1965 at the age of 94. 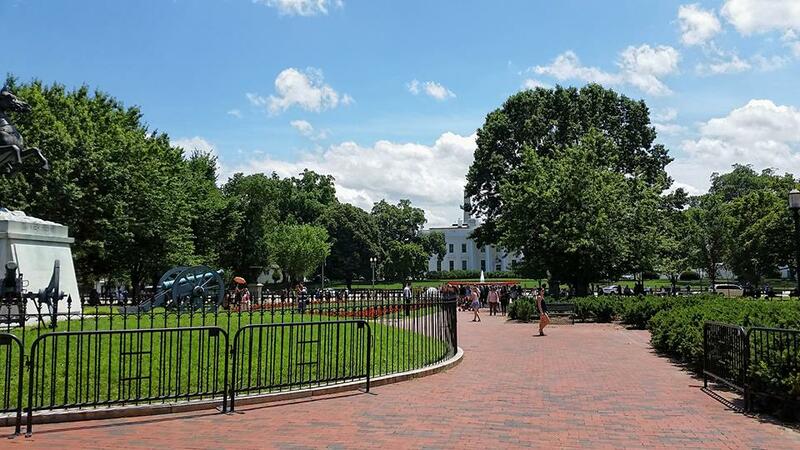 So in 1960, within days of his ninetieth birthday, a commemorative park bench in the his favorite spot across from the White House was dedicated to him by the Boy Scouts. When told of the bench and the planned ceremony to dedicate it, “Baruch said he hoped ‘the young people, who are the future of our country’ might receive inspiration from sitting on this bench in the future, as he had over the years.” So maybe I have some things I need to think through or a big decision to make, I’ll head over to Lafayette Square Park, sit on the bench and hope for a little inspiration. Headstone of Thomas P. “Tip” O’Neill, Jr.
On my visit to Historic Congressional Cemetery during this bike ride, I happened upon a headstone for someone I knew of and remember, but didn’t know was honored at the cemetery – Tip O’Neill. Located at 1801 E Street (MAP), in the southeast portion of D.C.’s Capitol Hill neighborhood, the cemetery got its name when in 1830 the United States Congress appropriated money for improvements, built cenotaphs to honor representatives who had died in office, and purchased several hundred burial sites to be used for members of Congress. 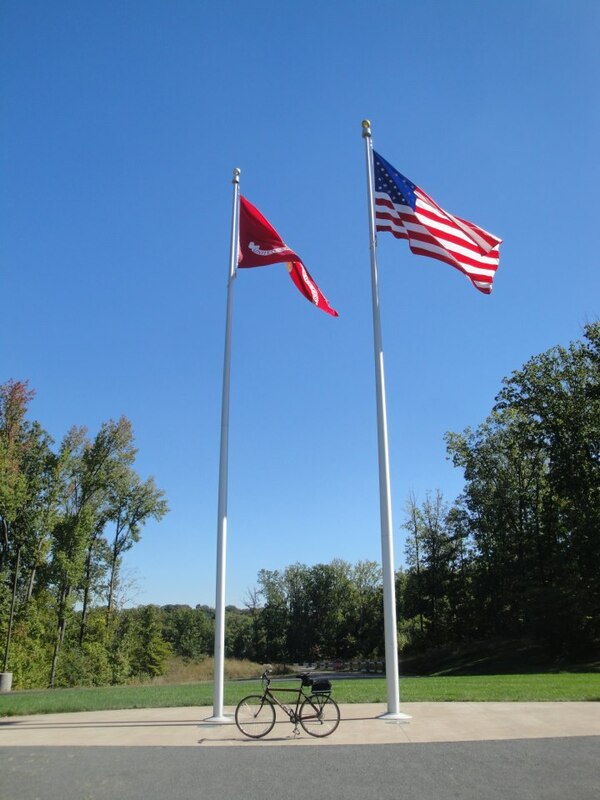 Although the cemetery itself is privately owned, the U.S. government owns 806 burial plots. This includes many members of Congress who died while Congress was in session. And I now know that Tip O’Neill is honored there among them. 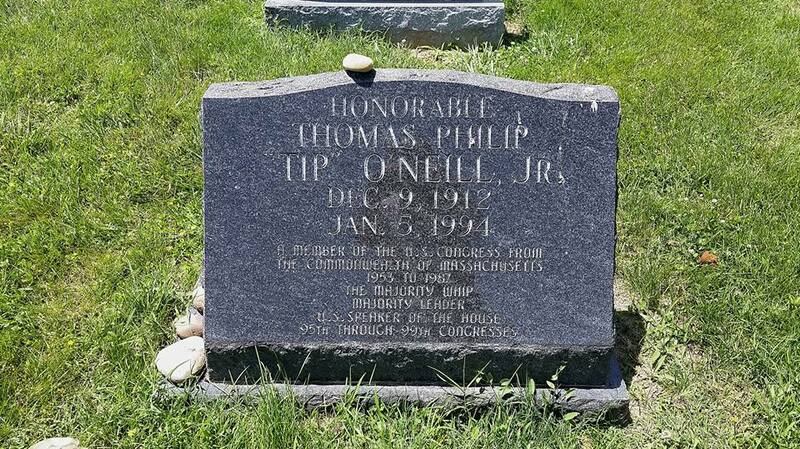 Thomas Phillip “Tip” O’Neill Jr. was born, raised, and lived out almost all of his life as a resident of North Cambridge, Massachusetts. It was also in North Cambridge where he got his start in politics. He first became active in politics at the age of 15, when he campaigned for Al Smith in the 1928 presidential election. Four years later, he helped campaign for Franklin D. Roosevelt. Then, as a senior at Boston College, O’Neill ran for a seat on the Cambridge City Council. It was his first race, and his first and only electoral defeat. But the campaign taught him a valuable lesson that would later become his best-known quote: “All politics is local.” O’Neill’s first electoral victory came shortly after he graduated from college, when he was elected at the age of 24 to the Massachusetts House of Representatives. From there he would go on to become the first Democratic Speaker of the Massachusetts House of Representatives in its history. He remained in that position until 1952, when he ran for the United States House of Representatives from his home district, and was elected to the congressional seat vacated by Senator-elect John F. Kennedy. O’Neill became a very outspoken liberal Democrat and influential member of the House of Representatives. He would be reelected 16 more times, and served for 34 years. In 1977, O’Neill was elected the Speaker of the House of Representatives. He served as Speaker until his retirement a decade later, making him the only Speaker to serve for five complete consecutive Congresses, and the one of the longest-serving Speakers in U.S. history. One of the first things that comes to my mind when remembering Tip O’Neill, particularly during the time near the end of his career, was that it was a time when politics and governing was not the animosity-filled, adversarial process that it is today. Republicans and Democrats could have differing opinions and significantly different political philosophies, but at the end of the day they were congenial, and even friendly with each other. And no two people exemplified this type of relationship better than Tip O’Neill and the President at that time, Ronald Reagan. Despite O’Neill being described by his official biographer, John Aloysius Farrell, as an “absolute, unrepentant, unreconstructed New Deal Democrat,” O’Neill was able to have a friendly relationship with a President who rehabilitated conservatism, led the modern conservative movement, and turned the nation to the right. O’Neill and Reagan vehemently disagreed on almost everything, yet were known to occasionally have a beer together at the end of the day, or get together along with their spouses for dinner. As I stood at the headstone and thought of those bygone days, I couldn’t help but lament the decline in the civility of the current political process in this country. I find it impossible to imagine Donald Trump and Hillary Clinton, along with Melania Trump and former President Bill Clinton, ever choosing to get together socially today. I miss the days when politicians and people could disagree with each other, yet still respect the other person and their opinion. And I think Tip O’Neill would feel the same way. UPDATE: I later learned that the maker in Congressional Cemetery is actually a cenotaph, not a headstone. A cenotaph is a monument built to honor a person or people whose remains are interred elsewhere or whose remains cannot be recovered. Tip O’Neill is buried in Mount Pleasant Cemetery in Harwich Port, Massachusetts.